This is a sponsored post courtesy of Trion Worlds. 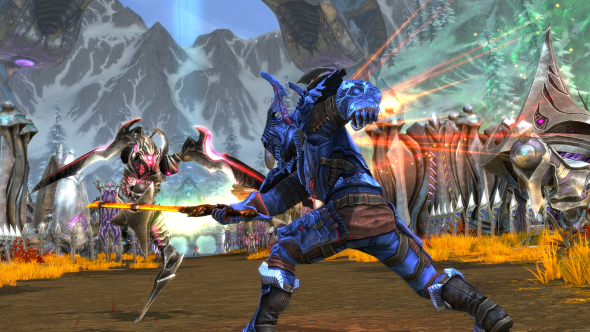 It seems like only yesterday that Rift led a brave new wave of MMOs onto the PC. But over half a decade later, it has taken on a new status as one of the most resilient games in the genre – having weathered plenty of change and introduced some of its own. 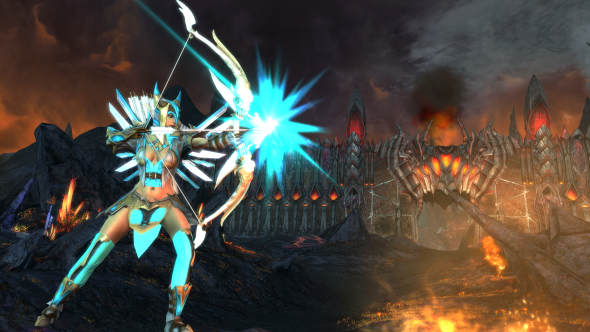 Rift’s latest transformation comes in the form of its 4.3 update, Crucia’s Claw, which releases today. Here are five reasons why you might want to get involved. Interested? Play Rift for free right now. Crucia’s Claw marks a crucial tipping point in Telaran current events. You see, Crucia is the name of a great dragon goddess of the Blood Storm. 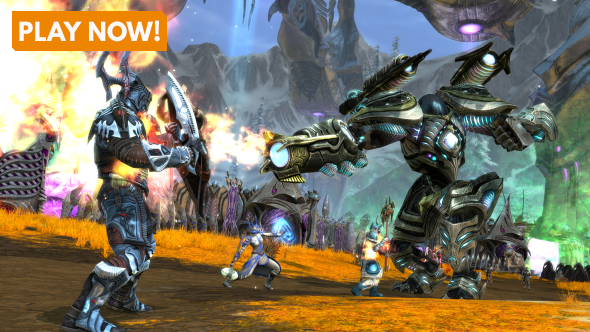 Remember hearing about Rift’s first expansion, Storm Legion? That was her legion. Now, Crucia has bent a more powerful force than ever before to her will, with the aim of destroying Ahnket. The upshot is that you, as the players – or the Ascended, as you are known in-game – are getting a new arena-style fight off the back of Crucia’s machinations. This raid, Bastion of Steel, will find you restoring the balance of power, and if you can have a lovely time with your mates in the process then all the better. Perhaps Crucia’s tyranny might do some good after all. What is a raid without huge, heavily-hit pointed enemies to coordinate your efforts against? Bastion of Steel introduces three generals in total. The first is Azranel, an angelic-looking mechanical construct with a less-than-heavenly tendency to try and cut you in half. Commander Isiel is the second, along with his intimidating Libritor Tank, the Vindicator MK1. If you are to succeed against them, you and your mates must take turns fighting Isiel and the Vindicator until both fall. Finally comes Crucia’s most powerful ally, a chap named Titan X. He should be easy to spot. Titan is a storm giant. You should know that souls are the classes of Rift. 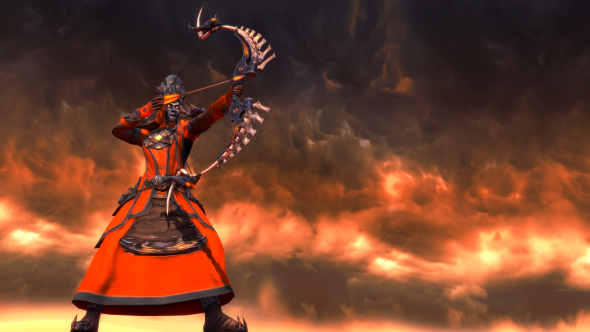 Important, as Crucia’s Claw introduces a brand new soul to the game: the Mystic Archer. 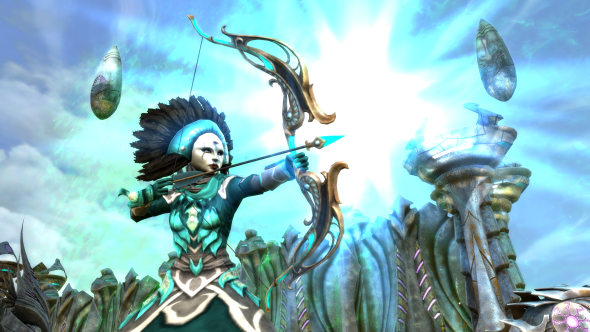 Where other wizards have so far cast their spells via traditionally mage-like equipment like staffs or daggers, the Mystic Archer focuses their power through a bow. There is an unusually high level of twitch skill involved in playing one, too – every offensive spell is an arrow that must be aimed, either via character movement or by placing AoE targets on the ground. Practice makes perfect, though, and soon enough you can be using successful spells to fuel even more powerful shots, reducing any enemy that passes in front of your sights to memory and a bundle of XP. 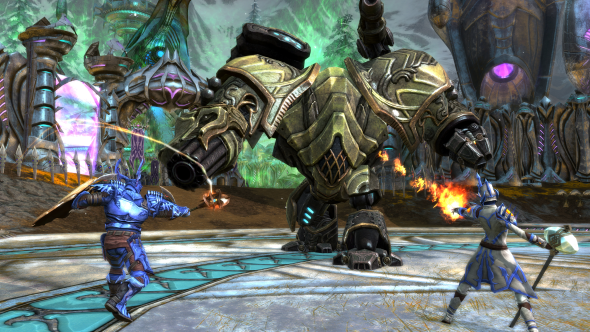 Rift joined the MMO free-to-play revolution back in 2013, and earned a lot of goodwill by not sticking arbitrary roadblocks in front of its non-paying players. Trion Worlds experimented with making the paid-for Prophecy of Ahnket expansion free a little while back too, and obviously liked the effect it had on Rift’s community. By June this year, they had decided to make the switch permanent. Which means everything that falls under the umbrella of the expansion – this update’s raid included – is available to anyone intrigued by it. Why keep yourself from a horde-like boss fight for the ages? If that’s got you in the mood, download and play Rift for free right now.